Thank you for visiting the AMAE Med Spa Blog, where we keep you updated on the latest day spa news and events. Check back often to read about the latest techniques and state-of-the-art technologies in anti-aging, skincare and body rejuvenation. The Nordlys Ellipse IPL laser skin treatment is an amazing, state-of-the-art, skin care technology that comes from Scandinavia – the land known for flawless skin! This Nordlys Ellipse IPL laser effectively treats a wide variety of skin conditions, including unsightly Dark Spots, by using a combination of fractional and infrared lasers in one device that can cover both small and large areas of the body. Birmingham AMAE Med Spa is one of the few facilities in Oakland County to offer this fast, comfortable, affordable, high-tech laser skin care treatment. In this article we discuss how the Nordlys Ellipse IPL laser treats Dark Spots. 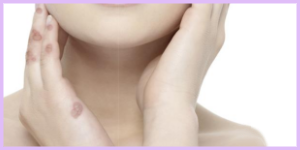 Dark spots on the face, neck and chest – also called benign pigmented lesions – usually have a hereditary component. However, long-term sun damage, combined with the natural aging process, can aggravate or contribute to the development of dark spots. 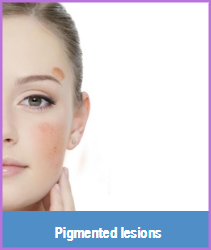 These skin “lesions” can vary greatly in size and color. The Ellipse Selective Waveband Technology (SWT®) treatment works by directing controlled pulses of light into the upper layer of the skin.Special ferequencies of pulsed light are chosen that will be absorbed by the body’s own melanin in the pigment. The pigment then convert the light energy into heat, which destroys the parts of the cells in which the melanin (coloring) is stored. This laser technique is called “Selective Photothermolysis”. Ellipse laser treatments are FDA approved and clinically proven to effectively remove the pigmented lesions (dark spots) on the epidermis (skin). The light produced by the Ellipse systems is carefully selected to produce the correct pulse length and wavelengths that will destroy the targeted pigmented (dark) skin cells without damaging any of the surrounding tissue. Birmingham double board certified plastic surgeon Dr. Ali offers the absolute best, state-of-the-art technologies in skin treatments, and dark ppot, wrinkle and line reduction. In addition to Nordlys Ellipse IPL laser skin treatments, we also offer Fraxel 1550 laser treatments as well as ThermiSmooth radio frequency skin treatments. Each laser skin treatment begins with a professional skin consultation. Treatments are selected and optimized to meet the specific needs of each client with the most innovative and comprehensive products and technologies. For optimal results we also offer custom packages of laser treatments, under the guidance of medical aesthetician Ramona, at our Birmingham Med Spa. Schedule a laser Dark Spot treatment – and then relax in our Birmingham Med Spa, while we make you look and feel younger and even more attractive!